In a journey shrouded in mystery and intrigue, Sir John Franklin's 1845 campaign in search of the Northwest Passage ended in tragedy. All 129 men were lost to the ice, and nothing from the expedition was retrieved, including two rare and valuable Greenwich chronometers. When one of the chronometers appears a century and a half later in London, in pristine condition and crudely disguised as a Victorian carriage clock, new questions arise about what really happened on that expedition--and the fates of the men involved. When Nelson Nilsson, an aimless drifter from Alberta, finds himself in Canada's Northern Territories in search of his brother, he meets Fay Morgan by chance. Fay has just arrived from London, hoping to find answers to her burning questions about her past. When they discover that their questions about their pasts and present are inextricably linked, the two will become unlikely partners as they unravel a mystery that traverses continents and centuries. In a narrative that crosses time and space, O'Loughlin delves deep into the history of Franklin's expedition through the eyes of the explorers themselves, addressing questions that have intrigued historians and readers for centuries. What motivated these men to strike out on dangerous campaigns in search of the unknown? What was at stake for them, and for those they left behind? And when things went wrong--things that couldn't be shared--what would they do to protect themselves and their discoveries? Ed O'Loughlin was born in Toronto and raised in Ireland. He reported from Africa for the Irish Times and other papers, and was Middle East correspondent for the Sydney Morning Herald and The Age of Melbourne. His first novel, Not Untrue and Not Unkind, was long listed for the 2009 Man Booker Prize. His second novel, Toploader, was published in 2011. "An ambitious undertaking, operating in several time frames, with the present action interrupted frequently by episodes taking place from 1845 well into the mid twentieth century. Real historic personages (e.g., Roald Amundsen and Jack London) are intermixed with fictional characters...An impressive work." "A compelling and hugely ambitious novel." "Gripping . . . O'Loughlin is operating at the interstices of truth and history, of that which can be known and that which cannot . . . The final pages seem inevitable, as great endings must; the whole novel wondrous in its tone and reach." "A book that gets you down to the marrow. 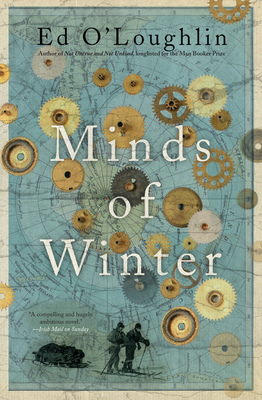 The compass of Ed O'Loughlin's Minds of Winter points north by northnorth. Up and up it goes, drawn by husky dogs towards the North Pole, chillier and chillier by degrees, frostbitten, snow-blind, but determined . . . Thrilling, Boys' Own, Hornblower stuff."